Tattoo Cover Ups Using Makeup! This tutorial will show you how to create temporary tattoo cover ups. So if you’re doing something where you need to just cover it up for a while, you can use this method. If however, you need a way to get rid of your ex boyfriend/ girlfriends/ mother’s name off your chest(yes, it seemed like a great idea at the time… I know…J), you’re going to need a good tattoo artist to alter it for you! The first and priciest option you have is to buy a good foundation for tattoo cover ups . This is for when you need serious coverage that will withstand all the elements! Now you’re going to be spending so much money on it… So try out a few brands at a store before you buy. Make sure that it matches your skin color, first of all. If you can’t get an exact match, get the closest two matches. One that’s darker and one that’s a bit lighter. Then play with the proportions to find your perfect match. Check how long it lasts through sweat and heat etc. Then once you know which one you prefer, you can go back, or just go online and buy it! The other option is to get regular tools and do the cover up. This is for when you only need to cover up once in a blue moon. Maybe for a meet the parent dinner, or photo shoot. Start by applying a red based product, like lipstick to the tattoo. Apply about 3 coats, letting each dry before applying the next. That way, you’ll know to get a green corrector. Apply Corrector using the concealer brush. Start by dabbing it all over, then blending. When you blend, don’t press the brush in because that moves the product around. Move it in feathery strokes, almost like hovering over the skin. Do this even with the concealer and foundation. Choose a concealer that is one shade lighter than your skin tone. 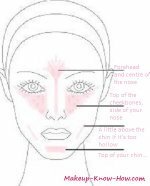 Apply it with the concealer brush as you did the corrector. Ideally, use a foundation formulated for tattoos. That way, it won’t easily rub off… The downside is that these can be expensive. Alternatively, find a regular long wear foundation. This foundation must match the color of your skin around your tattoo. So if you’re a woman and you have a foundation already, you might have to buy a different one because the tattoo’s hopefully not on your face! Apply it using flat foundation brush, and then blend in the way mentioned earlier. Use a powder puff to dab powder on the area. This sets the foundation, and makes it less likely to smudge.